Blaine County emergency services providers asked the county commissioners last week to support legislation to help fund a better communications system. Sheriff Gene Ramsey told the commissioners that the Idaho Statewide Interoperability Executive Council has put forth draft legislation that would raise the current $1 E-911 fee on all landlines and cell phones to $2 per line, with the extra going to fund grants for new radios and help fund dispatch staffing. The levy has not been raised since 1986. The proposed legislation was prompted by a switch in state law enforcement radios to a 700 MHz radio system, which enhances interoperability among emergency services providers nationwide. Ramsey said the county switched to 700 MHz radios in 2009, expanding radio coverage and allowing county officers to communicate with other agents across the state and even the nation. However, he said maintaining such a system is expensive. The Sheriff’s Office received a $1.3 million federal grant in 2009 to buy radios and set up 700 MHz repeaters on Dollar Mountain, Bald Mountain and in the Picabo hills—but maintenance fees run $32,000 a year, with $80,000 software upgrades due every two years. If the proposed legislation passes, the county would receive $1.25 of the $2 E-911 fee, part of which could go toward paying dispatch salaries and services. Two cents of that fee would go to cell phone providers, such as Verizon and AT&T, for collection costs. 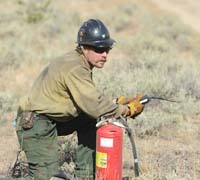 The remaining 73 cents would be split into two funds: one Statewide Interoperability Executive Council fund to set up a grant fund for 700 MHz-compatible radios across the state, and one Idaho Emergency Communications Commission grant fund to help pay for infrastructure across the state. Ramsey said the radio grant funded by the state council would allow fire departments to apply for grants for new radios. The other grant could help pay maintenance fees and for software upgrades, placing the burden on the state rather than counties. “What we need is sustainability in Blaine County, so we’re not paying for our own maintenance,” he said. Wood River Fire & Rescue Chief Bart Lassman and Ketchum Fire Department Chief Mike Elle said the grant fund created through this legislation would aid the fire departments, which have not made the switch to 700 MHz because of the expense. Elle said that if his department switched its radios from a VHF system to 700 MHz, it would cost $12,000 per year in subscriber fees. “It’s pretty hard to sell that to the elected officials, especially when our partners, the federal agencies, are not going to 700 MHz,” he said. Lassman added that it would take $250,000 to bring Wood River Fire & Rescue completely into the 700 MHz system, excluding the annual user fees. The proposed legislation, however, would eliminate those user fees, which currently go to pay for maintenance and upgrades. Blaine County Emergency Communications Director Robin Stellers said the fees do not cover software upgrades, which is why a state-based solution is needed. Ramsey said that even though the proposed legislation has support from the council and law enforcement, he doesn’t believe it has a good chance of passing. The commissioners agreed to view a draft resolution supporting the legislation at a future meeting. Lassman said he would write that and bring it before the commissioners early next year.